El Cafe de la Opera is a gourmet / formal restaurant offering Mediterranean cuisine. The average price of a main course dish at the El Cafe de la Opera restaurant is 25 euros. The average price of a 3-course meal at the El Cafe de la Opera restaurant is 55 euros. Note that although GoMadrid.com strives to maintain all information about El Cafe de la Opera up to date, the prices mentioned are only an indication and may not reflect the exact value of your meal. El Café de la Opera offers every night a singular, unique and sometimes magic show. A selection of young promising opera singers from Spanish classical music schools serve every night a very special dinner in their role of singing-waiters. They provide an interesting selection of Arias, Duets, Quartets and the traditional Zarzuela (Spanish operetta), to accompany the mediterranean cuisine. Their all-singing finale to end the dinner, glass of cava (Spanish champagne-like wine) in hand, makes this a unique experience if you are in the city of Madrid. 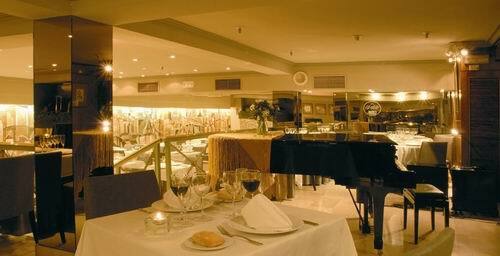 The address of the El Cafe de la Opera restaurant is: Arrieta 6, 28013 Madrid. The nearest Metro station is Opera. Please see the El Cafe de la Opera restaurant location map below.